We already have been using the six-pages about Thomas in the Great Migration books (NEHGS copy). There has been additional material published by the project. Yesterday, I ran across this web site that is using Wiki technology to provide information about early entrants. Below is a link to the page dealing with Thomas. One of our goals will be to contribute to this site, especially on the Old Planters of Cape Ann. Notice the people who haven't been written up yet (Great Migration Study Project Sketches). 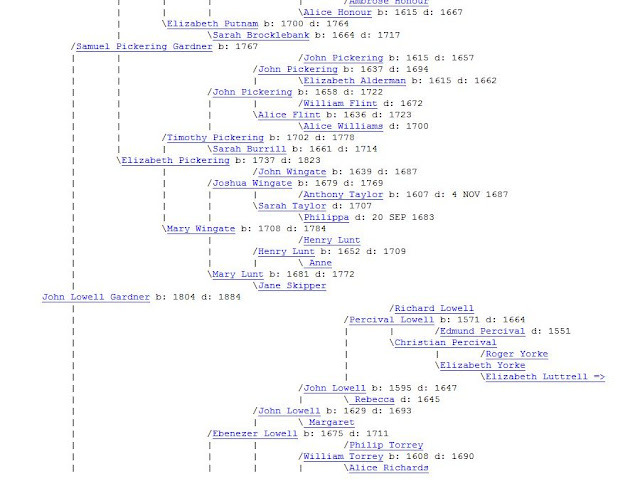 This type of work represents how to apply technology to support genealogy via the web (On blogs and other modern means). We know that some old-world-based research will be required. For starters, we ought to look at work that has already been done (including mentioning that Frank left some notes -- where are those?). So, expect those findings to show up here. Not exactly an aside: Thomas' son, Richard, was said to have been considerably educated, and Thomas did do work that required literacy, etc. Richard must have gotten his learning from association with his parents. In fact, Thomas' son, Joseph, worked as a lawyer. There was no 'law' school here. No doubt, Thomas received some type of schooling. Where? But, the thing that looms largest is that Thomas was in an authority position in an endeavor that involved many families (about the investors). That type of responsibility being conveyed would not have happened with an unknown. Of course, Thomas was effective; there is more evidence for that than his descendants. 11/28/2012 -- The above 'werelate' page has more information than that of Dr. Frank and the Great Migration Study which we'll have to scrutinize. The Wikipedia page, of course, is being edited by TGS, for the most part. 04/30/2012 -- Old Planters (seems to be one of the more popular posts) updated to use the list from the Winthrop Society. 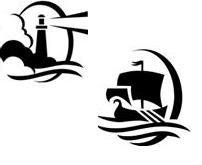 The sea has associations with the New England culture that are similar to those of the English culture. Whereas on the continent, people could move about on the land somewhat easily, and in a wider scope, those on an island have limited ways to move. Of course, technical and cultural factors inhibited movement even on land, depending upon the clime and situation. Yet, the existence of wandering peoples is sufficient to show that people need to, or must, move about; land movement has been going on for a long time. Sea venturing, on the other hand, took awhile to become a feasible mode for more than the hearty few. We cannot look closely here at seagoing improvements though that would be of interest. And, given modern technology, travel by aircraft seems to have superseded that of land and sea as a natural progression, almost. That is, we find the use of movement by air for the longer haul with lighter loads and, perhaps, for greater comfort. However, there are many types of shipment that require crossing the waters. So, we have the sea as barrier. But, too, the sea is a provider. There are many tales about this. See Vol. II, No. 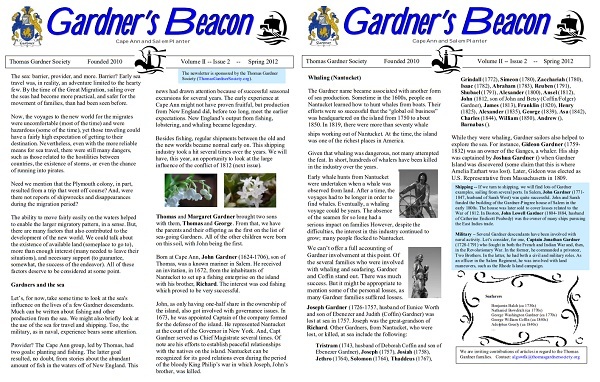 2 of Gardner's Beacon for a brief look at one example of seafaring Gardners, namely those on Nantucket. 03/08/2019 -- Added image in order to add to index at our portal to truth. 12/05/2014 -- There was some discussion about "migrates" (2nd para, 1st sen) as to whether it was an error or a inappropriate usage. No, it was not an error. Perhaps, too much license was taken. Not. "migrates" is for the set of those who migrated (very big set). "migrants" has too many connotations of ill repute of late; as well, these folks were not migratory (in many cases, they stayed though we do find that some did do a little moving around in the territory). Our ancestors, in this case, were coming over for their purpose(s) and with great desire to succeed. Too, they left us quite a legacy. So, they just shifted their living quarters albeit with much hardship and effort. ... Ah, 1998 biochemical usage. Note: See Remarks 04/08/2014 for status related to rootsweb trees. Many posts in this blog have pointers to work done by other families. For the most part, these were links right into an area of a database (via ID). Of course, that is not considered proper if one wants persistence. Why? As databases update, IDs can be re-assigned. Not always, but often enough so that following the link does not show what is expected. Here is an example via images. The fix, which is a simple re-fresh of the search, is easy; the purpose of this post is to document the method. The example relates to an ancestor of the John Lowell Gardners. The descendants list on the right was what was expected from picking the link. What came up was on the left. In the past, the blogger has been going back to update pointers when he runs across one of these ID changes. However, as we go along, we get more and more pointers. It's time to make a more permanent, and maintainable, edit. The newer pointers will have a new format; progress in the edit will be seen from the older pointers disappearing (no expected time for completion of the task). In the meantime, here is how to recover the information (via ID) for the person for whom we have a pointer, assuming that they have not been removed from the database. 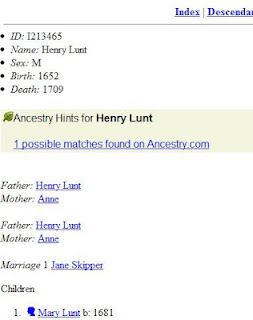 To set the context, see this page and look at son, Henry, and his wife, Jane. There were three descendants lists (different researchers) offered in the post: Standish, Dowling and Larson. In this case, it was the last one that had changed. The context tells what we're looking to see, namely Henry and Jane. If that does not appear, the first step is to go to Index and search. The format is "lastname, first name" and will bring up a list starting with that name (or something close if the exact name is not found). 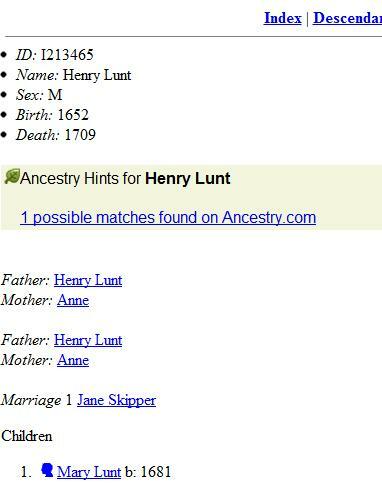 So, in this case, we know that Henry was born about 1651. He's the second on this particular list. Pick the person to get the related page. 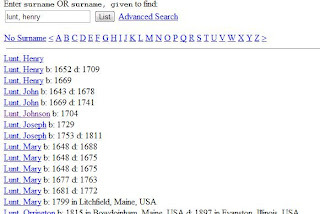 Now, across the page is a menu for Index, Descendancy, Pedigree, etc. The Pedigree chart is shown in many cases when the pointer is selected. This is the text format. There is also a table format which is selected by a toggle. Above, there are a couple examples of the descendants list. 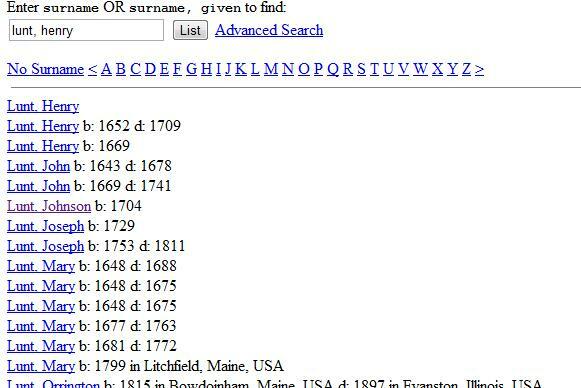 Now, the new format will include the database name, the person, and the birth year. That would allow search, plus help filter as, for any name, there can be many people. If the birth year is not known, there'll be the death year. If neither is known, we'll look for some other piece of information to distinguish the person. Here is the pointer for John Lowell Gardner (Larson, b 1804). 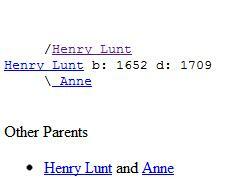 And, the pedigree showing Henry Lunt. 04/09/2014 -- The problem has been corrected. There is no note on the status change (it would be nice to hear why this happened and what it might mean for a new thrust for ancestry.com). 04/08/2014 -- Today, the behavior of rootsweb is different than it has been until now. Yesterday, it was still allowing access to "world connect" page via the cgi-bin method. Is the change observed today permanent? The rootsweb status page says that there is a problem (does not give a time for fixing - also, points to Chrome and IE - says that Firefox is working - nope! - as well, Sea Monkey shows the same behavior). What does that tell us? In any case, the discussion of this post is now on the table again. Apologies are offered, in advance, for pointers embedded throughout the blog that, when picked, will cause the session to be directed to the ancestry.com site. 04/17/2012 -- This exercise will end up with a standard pointer that is more persistent than what we've used so far. We'll post the resulting formatted pointer here.